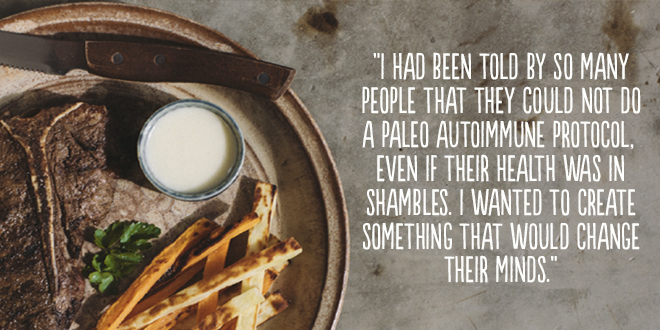 Those with autoimmune diseases like multiple sclerosis, Hashimoto’s thyroiditis, celiac disease, and rheumatoid arthritis are finding freedom from their symptoms via an autoimmune Paleo diet protocol (AIP). As outlined in Chapter 21 of It Starts WIth Food, an AIP is even more restrictive than a traditional Whole30®, and can be intimidating for even experienced Paleo followers. What’s for breakfast if you can’t have eggs? How can you enjoy Mexican food without nightshades? We recently added a new AIP shopping list to our resources, but today, we’re thrilled to introduce you to a new resource that will prove even more helpful. 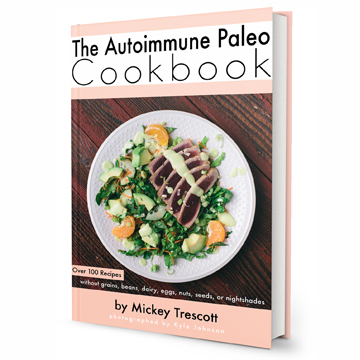 Meet Mickey Trescott, author of the new Autoimmune Paleo Cookbook. Mickey has crafted 110 recipes without grains, legumes, dairy, eggs, nuts, seeds, nightshades, or nightshade spices. She’s finagled amazing workarounds for mayonaise, turned up the heat without nightshades, and includes some special occasion treats that don’t rely on nuts or nut flours. The recipes are inspired, delicious, and best of all, 101* of these recipes are appropriate for your AIP Whole30 program. *Save most of the “dessert” section for life after your Whole3o – but feel free to enjoy the cinnamon-ginger baked pears! 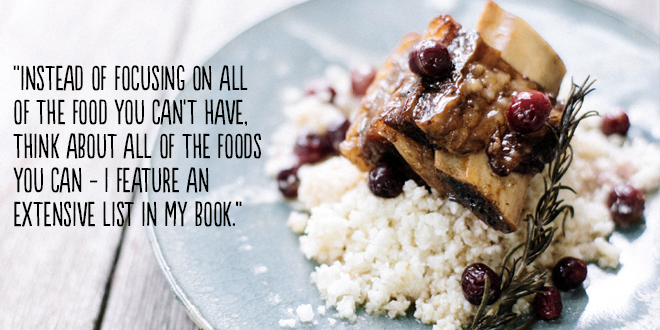 To introduce you to the Autoimmune Paleo Cookbook, we sat down with personal chef and author Mickey Trescott, to answer your most common questions about adopting an autoimmune paleo protocol. 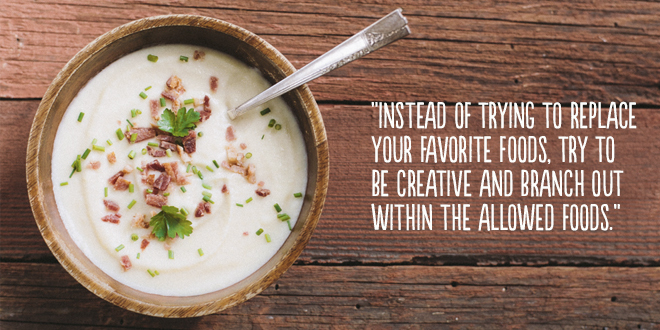 Why did you wanted to create an autoimmune protocol cookbook? I discovered Paleo after being diagnosed with both Celiac and Hashimoto’s disease, and not finding any success in conventional treatment. I developed neurological and connective tissue symptoms, and my health declined to the point where I could no longer work. I continued to see specialists, all who suggested that I needed to wait and see how my symptoms progressed before making a diagnosis. In an act of desperation, I decided to switch from my vegan diet to a Paleo diet. However, it was quickly apparent that even “healthy” Paleo foods (like eggs and nightshades) were contributing to my symptoms. 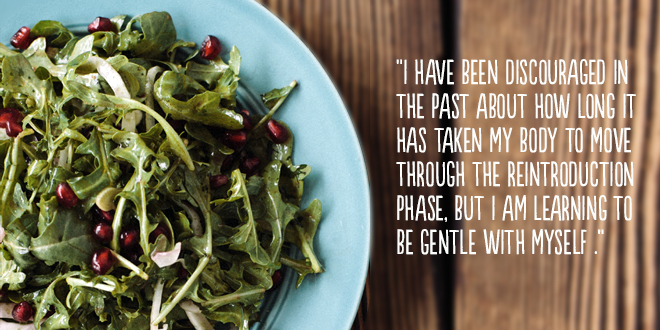 This lead me to adopting a Paleo autoimmune protocol (AIP). After a few months of eating this way, the scary symptoms disappeared and I found myself with enough energy to return to work part-time as a personal chef. Another few months, and I was feeling really energetic and fantastic – in fact, I couldn’t remember ever feeling so good. I returned to work full-time, enrolled in a nutritional therapy program, and started to blog about my experience. I continued to stay on the protocol long-term, both because I did not have good luck with reintroductions, and because I felt better with every passing month. There are currently very few resources devoted to recipes for the strictest phase of the AIP. It was such a life-changing and empowering experience for me, and I wanted to put all of my tips, tricks, and recipes together in a book for others to use. In addition to being a recipe and guide for the protocol, I wanted it to be visually inspiring and highlight all of the incredible food a person can still enjoy while eating this way. My hope is that with this tool at their disposal, nobody has an excuse to not to try it. What are the biggest challenges of undertaking an AI protocol? The biggest challenge is definitely the organization and planning. It isn’t really something you can find out about one day, and the implement the next. You have to think through things like breakfast, snacks, emergency meals, events like weddings, and socializing with friends and family. In the beginning, it is hard to go 100% all-in with the protocol, especially if you haven’t done all of the research and planned effectively. It is really important to be diligent, do your research, and make sure that you are able to start the protocol when you know you can be 100% compliant. Another challenge is reintroduction. It is very important after the initial elimination period that you do not go hog-wild and eat all of the avoided foods at the same time. Foods must be reintroduced systematically, one at a time, so that you can effectively see how that food is contributing (if at all) to your symptoms. If you introduce too many foods in a short period of time, it is impossible to tell which food is causing a reaction. While the initial elimination diet may only last a month, it might take another full month or more to go through reintroductions, slowly and systematically. You must plan for this in order to be successful. What foods or meals do you miss the most, and how have you worked around the ingredients you can no longer have? I really miss heat – I used to put paprika and cayenne on everything! For me, nightshades create autoimmune flares, even with mild exposure. In place of nightshades, I have learned to go without tomatoes and peppers in my salad and instead use cucumbers, apples, and olives. I increase the garlic and ginger in a lot of recipes that would usually have nightshades to give them more bite. I even use raw garlic in some sauces and dressings, which adds a lot of heat. I also make things like BBQ sauce and curry with a more savory profile than their typical spicy ones. I use coconut products (mainly coconut butter and homemade coconut milk) to create thick, creamy dressings, sauces, and soups. Adding a strong flavor (like anchovies and capers for a Caesar, or raw garlic and lemon for a ranch dressing) really makes it hard to tell that it is coconut. While I used to focus a lot on spice and different flavor combinations, I find myself looking to try different varieties and cuts of meat to keep things interesting. Since I don’t eat out anymore, I use the money that I used to spend on dining out to buy more exotic meats from my local farmers – lately I have tried rabbit, goat, and bison. Even if it isn’t exotic, I enjoy getting a nice hunk of protein and cooking it to perfection. Not eating eggs is hard for people to wrap their heads around. What do you eat for breakfast? I make sausage patties out of any ground meat, like beef, lamb, turkey, pork or chicken with lots of fresh herbs and sea salt. I cook them all in a big batch, and freeze them individually between pieces of wax paper. I usually have at least two different kinds in the freezer, so that I am not eating the same thing every day. In the morning, I pick my protein and defrost on low heat in a skillet. While that is warming up, I assemble some vegetables to eat with it – usually leftover from the night before, with some fermented veggies, a mug of bone broth, and sometimes a piece of fruit. Another go-to breakfast is leftover soup or stew, topped with some ferments and avocado. I will also mash up a can of salmon or sardines with some carrot, olives, cucumber and parsley for a little breakfast salad. Breakfast is so important, and it is the meal that I find people are most tempted to skip or use convenience foods. I noticed a huge improvement in my health when I prioritized eating a large, nutrient-dense breakfast with plenty of protein and fat every morning. The only thing that makes an Autoimmune Protocol breakfast different from any other meal, is that it needs to be prepared more quickly than others, making planning extremely important. An AI protocol can be overwhelming. How do you suggest people get started? The Autoimmune Protocol is incredibly overwhelming at first! My first suggestion is to make sure you get organized. Print out the lists of foods to eat and avoid (found in my cookbook), research how and why the protocol works, and really do your work to thoughtfully plan out your month (or more) on the protocol. 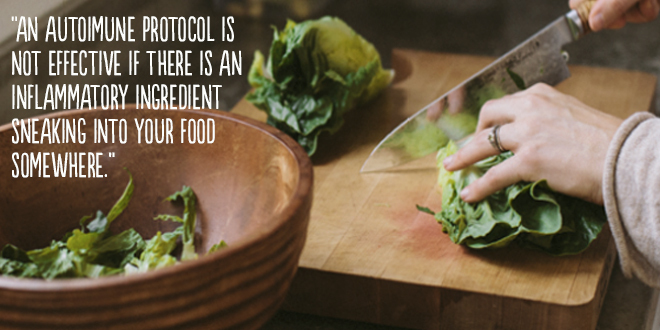 Begin the protocol when you can have your fridge and cupboards empty, so you can start off with a clean slate. Make sure to shop often, so that you are always cooking your produce and meats fresh. If you have a farmer’s market near you, get inspired by the bounty that is in season and available in your area. Another tip is to always have food available should you get hungry. Batch cooking will help decrease the time you spend cooking, as well as make sure that you always have something nourishing to eat on hand. This is when having homemade sausage patties, soups, stews, and broth stocked up in the freezer is really handy. Keep a can of sardines or salmon and coconut butter at work just in case you might have to be there late unexpectedly. Don’t give yourself any opportunity to stray should something come up. Have you reintroduced any AIP foods into your diet? What has that experience been like? I was able to reintroduce nuts, seeds and egg yolks back into my diet, all pretty quickly after my original elimination phase. I did not have success reintroducing egg whites, dairy, or nightshades at that point. After about a year of eating strictly Autoimmune Protocol plus nuts, seeds, and egg yolks, I have recently been able to reintroduce whole eggs, provided they come from chickens not fed soy and only if I don’t eat them very often – my limit is once or twice a week. I accidentally get “nightshaded” now and then, mostly when I attempt to eat out. That always causes a pretty bad autoimmune reaction, so I will be avoiding them for the long term, along with dairy, which I have always had a severe reaction to. I have been discouraged in the past about how long it has taken my body to move through the reintroduction phase, but I am learning to be gentle with myself and grateful for my current state of health and not sick like I was before. Sometimes, all you need is a little perspective! Mickey has created a special 20-page preview of the Autoimmune Paleo Cookbook just for Whole9 readers. Check out her table of contents, shopping lists, and a taste of her AIP recipes, and follow the links at the end of the document to purchase your copy* of the Autoimmune Paleo Cookbook for just $17. *The Autoimmune Paleo Cookbook is an e-book, available for immediate download in electronic form. It is currently not available in hardcover format. Do you have questions about adopting an autoimmune Whole30 program? We’ll answer them in comments. This seems like a fantastic resource, and it was great getting a preview of Mickey’s substitution techniques. Thank you for the introduction! So happy to have this new cookbook as a reference. I found the Whole9 lifestyle after being diagnosed with Leaky Gut and advised due to my high anti-body count from my Hashimoto’s Thyroiditis. Since January my world has changed by following Whole30 guidelines with the added elimination of eggs, nuts, lectins and nightshades. Mickey, thank you for creating this treasure as one more cooking reference that can speak directly to my needs to continue to health, be robust and healthy! I love Mickey and her cookbook! The pictures are amazing and the recipes are delicious. Her website has a ton of great information too. I highly recommend everyone buy the cookbook (AIP or not) – at $19 it’s a steal. Hi! This sounds like the perfect cookbook for me. When does the hardcover copy release? I like tangible books ( : Thank you! Does this format automatically on a Kindle Fire HD? Hannah, unfortunately, I don’t believe there is a hardcover cookbook in the works. What we do with all of our e-books is print them on nice paper, and then put them in a binder. It’s not exactly the same as a nice hardcover cookbook, but it gets the job done for people who want to flip physical pages. Pogonia, I haven’t tried importing this into my Kindle yet, so I can’t say for sure. I know you can email yourself PDF documents, to your special Kindle mailing address, and view them… I’m just not sure how this format would look. I never cook from my Kindle, so I don’t have much experience with this. will the cookbook eventually be in hard copy? your photos are beautiful – I’d love to have it on my shelf! Pogonia – From what I have heard from kindle fire users, the book works fine. You can download directly to the device or transfer the .pdf. How do you make water kefir without added sugar? I have tried plain coconut water. Thank you so much for this cookbook. Great!!!! Most paleo cookbooks are useless to me as every single recipes contains either eggs, nuts, or nightshades!!!! Water kefir needs sugar, in some form for the culture to “eat” as it ferments. You could try other juices in addition to coconut water to start. “Jicama, Pear, and Mint Salad” — uhhhm, I *need* this recipe! Same with the Citrus-Thyme Pot Roast… and curious about Coconut Pesto. Looks like a great book for the kitchen arsenal! I attempted to download after I purchased the cookbook. Unfortunately, all I got on my iPad is a blank 1MB file. Is there another way I can download this file? The link initially given to me has expired. Thanks! I downloaded the PDF to my laptop. Unfortunately, I don’t have access to a printer at home. I tried to email it to myself, so I can print a copy at work, but it’s not allowing me to do so. Any suggestions or explanations as to why this is? Melissa – I don’t know why you’re having trouble, but I just emailed you the preview. Can I get a paper book somewhere? I hate reading from a screen. Hi Mickey – great book! I’d like to print it out, however when I took it to Staples they would not print it because of copyright issues. They will accept an email from you giving permission to print it. Would you be able to send me an email giving permission to print your wonderful book? Just a preference of having an actual book – Thanks so much! Hi, I’m reading through the autoimmune protocol and I have some questions about certain foods. Is cumin acceptable? I also see that there are only a couple types of vinegar used in the cookbook. Can anyone elaborate on the use of other types of vinegar (white vinegar, red wine vinegar, balsamic, etc)? Thanks! Cumin is not included in the autoimmune protocol because it is a seed. All of the vinegars you mentioned are fine, although I have heard that some people react to balsamic. Some companies use wheat paste to seal the barrels that they age the vinegars in, so you want to make sure to use a product that is gluten-free (call the company if it doesn’t say on the label). I don’t include balsamic in my recipes for this reason. Good luck! I wanted to ask if you thought the book would be worth paying for if you don’t eat a lot of meat. For religious reasons, I don’t eat any pig.The only meats I can tolerate are chicken and turkey. Are there enough recipes that include those that would make it worth purchasing? I also wanted to add that I do like seafood, but can’t afford it, and I can’t eat meat for breakfast (at least during the week). I wake up at 5am for work so I eat breakfast at 6am, and the smell of meat that early makes me nauseated. Do you have other breakfast ideas? I do seem to do ok with turkey bacon. 27 out of the 118 recipes contain red meat or seafood. There are 10 recipes in the chicken section. It is up to you to decide if that is worth it to you – most of the appetizers, soups, and vegetable sides would be fine for you. As far as breakfast ideas, I would try to break yourself in to eating at least a little protein in the morning – maybe a couple of meatballs made from ground chicken, or a homemade chicken or turkey patty with a side of vegetables. I would stay away from fruit or anything overly sweet first thing in the morning. If you can’t stomach the meat, I would try a hearty serving of veggies topped with lots of fat – like coconut or olive oil. Hope it helps! I take a daily drink called Shakeology ( it is vegan). if I was to start this plan could i continue, do you know much about Shakeology? My 3 year old has pretty severe eczema and we are at our wits end. We have only recently learned about GAPS and/or Paleo AIP. Totally overwhelming, but so thankful to find some type of potential relief for my little girl. Do you find folks with children are having much luck with your recipes, my girl is so picky, but we really believe this may be the best option to begin to heal her. Kyle, unfortunately Shakeology includes less healthy vegetarian protein sources from grains and legumes, which are not allowed on an AI program (or the Whole30). As for your picky 3-year-old, I think the program is totally doable, even if you don’t have a lot of variety in her meals going forward. The point is to get through a period of elimination so you can identify which foods may be triggering her eczema. You’ll have to e strict with your food choices, so focus on that and don’t sweat if she’s not eating a lot of different things or getting perfectly balanced meals for the first week or two. I have both Hashimoto and Meneries, can you explain more on your body’s reaction during the reintroduction period. What symptoms did you experience when you introduced egg whites? Nightshades? I have heard mention of reactions but not fully understanding what happens. Ps. I love the AIP cookbook! It is important to mention that you do need to be feeling better before you start reintroducing foods. This doesn’t mean that your symptoms all go away, but you do need some measurable improvement otherwise you have nothing to gauge your reactions with. A reaction can be anything ranging from mood changes, digestive changes, skin reactions, to simply the return of your autoimmune symptoms. Most of us are different – but for me I get digestive upset when eating eggs, and if I continue with them I get a return of fatigue. I get joint pain and swelling with nightshades. When you are ready to go there, keep a journal, and take it slow. Good luck! I would like to purchase the cook book. Can you please email the information on how to purchase it? Thank you. Click on the links above (http://whole9life.com/downloads/AIP-Cookbook-Preview-Whole9.pdf) to see a preview. Links to purchase are sprinkled throughout the preview. I’m wondering how you reintroduce egg yolks without getting any egg white in them. When I separate eggs, there is always a bit of white stuck to the yolks. I separate the whites, then put the yolk carefully in a paper towel, puncture it with the tip of a knife, and squeeze out the contents. I then discard the membrane (or put it with the white, for someone else to cook up). That is the only way I know where you can be entirely sure you are not getting any white in there. Good luck! Thanks Mickey! I’m pretty sure I react badly to eggs, but I’m hoping maybe I will be able to tolerate yolks. I really need to do this autoimmune protocol, but I’m sensitive to coconut! I see in the sample that a lot of recipes use coconut milk or coconut flour. Is there anything else I could use as a substitute or would it be possible to leave it out? Thank you! I am sorry you don’t tolerate coconut, as I have found it is the best replacement for dairy in creamy recipes. Of the 118 recipes in the book, you can make over 80 of them without coconut, by either substituting an alternate fat (lard or tallow) or just leaving it out. You won’t be able to make the creamy dressings or desserts – I would advise trying the other dressings in the book instead (there are a couple of nice creamy avocado ones!). If you purchase the book and aren’t happy with the quantity of recipes you can make coconut-free, just shoot me an email and I will give you a refund. I am planning to join the January Whole 30 program and would like to know if there is an autoimmune protocol that you offer for those of us who are needing to eat with autoimmune issues. Any word on when Mickey Trescott’s book will be available in hardcover? We have a general autoimmine protocol outlined in our book It Starts With Food, and a shopping list for those on a general AIP here: http://whole9life.com/book/ISWF-Shopping-List-Autoimmune.pdf. I know that the protein butyrophilin is present in butter, is it also present in ghee. If someone tested “equivocal” or “positive” on the cyrex labs array 4 for milk butyrophilin would it still be safe to consume ghee? 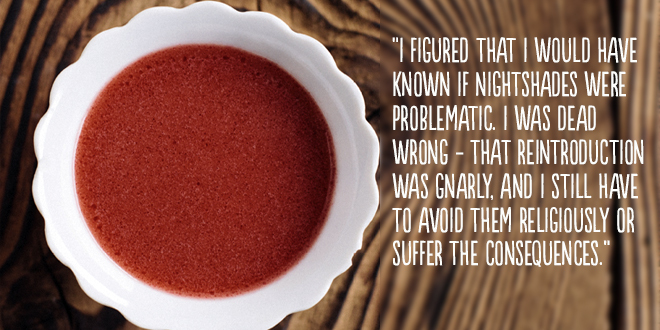 Although a lot of people with dairy intolerance can consume ghee, those who are very sensitive still react to it. If you are going to try the autoimmune protocol, it is recommended to leave it out for the elimination phase (at least 30 days) and then reintroduce when you get to that phase. I would definitely avoid also, if it came up on your cyrex panel. Can I eat pickles ? Irene, yes pickles are fine but double-check the ingredients just in case. Mickey, your cookbook and recipes look great! I would like to know if your version of AIP follows a low carb protocol that has also taken in account the carbs/sugars in fruit (mango), dried fruit (dates, figs), potatoes, root vegetables and the like? The book is not specifically low-carb. Of the foods you listed, the only ones it does not include would be potatoes, because they are nightshades. I downloaded the 20 page preview. Looks great. What do you have for the person with Leaky Gut, Celiac’s, and Hashimoto’s? I’ve got Celiac and Hashimoto’s–not sure specifically what your question is asking, but this book is suitable for anyone with autoimmune disease and/or leaky gut. I get migraines from eating coconut and products with anything in them. Do you have a good alternative to coconut flour, cream, milk etc? Please see my reply to Mindy up above for some substitution ideas for the recipes with coconut in them!